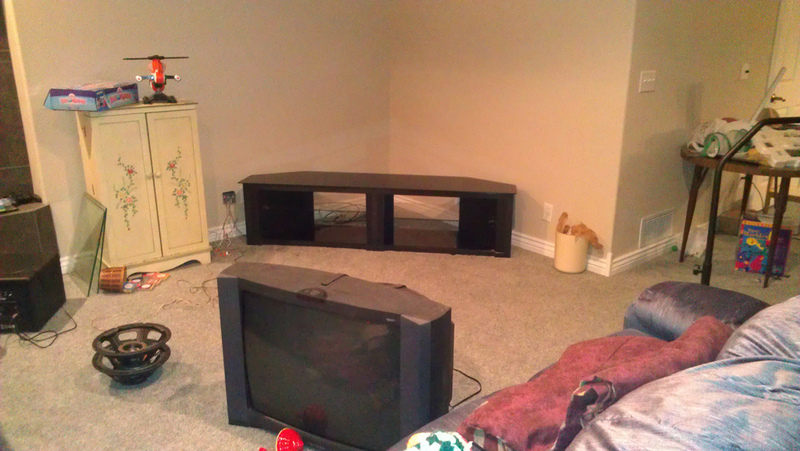 With heavy heart, I began to dismantle the old entertainment center this morning. I got most of the "removable" parts off, and then I started trying to remove the glued in parts. 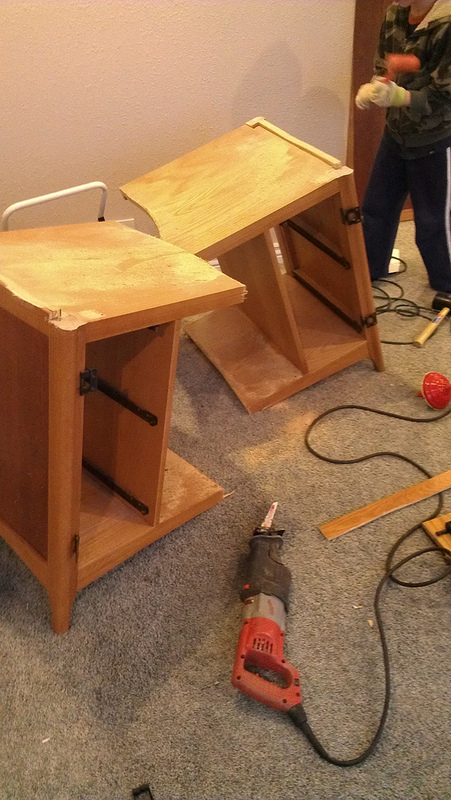 The entire top, with shelf, came off surprisingly easily, being held in with just a few screws and gravity. 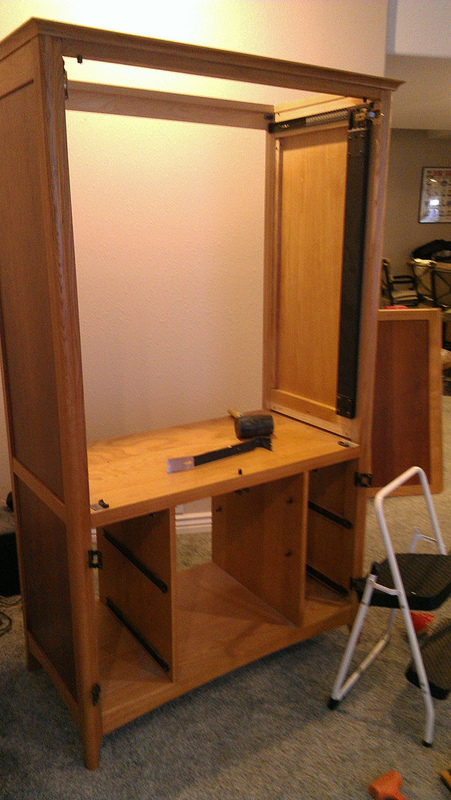 MaxieC worked to dismantle the top while I strategized on the rest of the case. 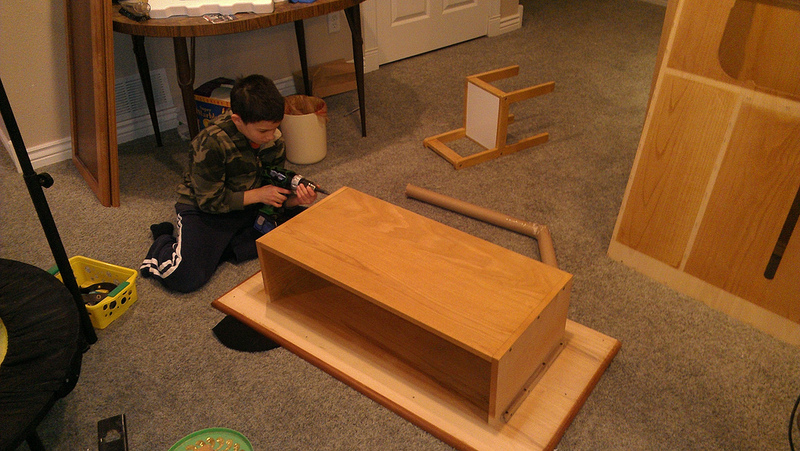 He had a great time using the power drill to remove all the wood screws. Funny thing, though. 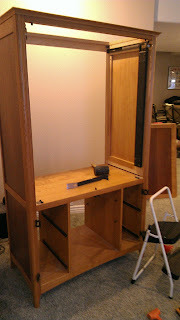 As we got farther and farther into the dismantling, I found more and more parts that were not solid wood. In fact, it seemed like nearly everything was press board with a very high quality wood laminate on the surface. The only things that turned out to be actually solid wood were the four corner posts and the trim frame around the top. Everything else was fake. When I bought this from a name-brand furniture store, it was sold to me as solid wood. But the whole damn thing is fake. Very high quality fake, mind you, but still fake. What a rip. Well, when the entire purpose of carefully disassembling the piece is premised upon saving the wood, and then you find out that there isn't actually any wood to save, there's a tool specifically designed for that. It's made by Milwaukee, and if you load it up with a blade called "The Ax" that is designed for demolition, well, hell, things get fun real fast. We then spent about an hour putting together the new, much much cheaper entertainment stand that will hold whatever goodies we get this Christmas. It says the top can hold 200 lbs., but is not allowed to hold a tube TV . Odd, as my tube TV doesn't weigh anything near 200 lbs. The corner TV mount arrives via UPS on Tuesday. Once I get that up on the wall, I'll probably have to decide on which TV Santa will bring.